The collection was transferred from the University Library to the University Archives and Records Center in 1956 as part of the records of the Zelosophic Society of the University of Pennsylvania. The Franklin Scientific Society records are in one series: Minutes, 1876 – 1882. 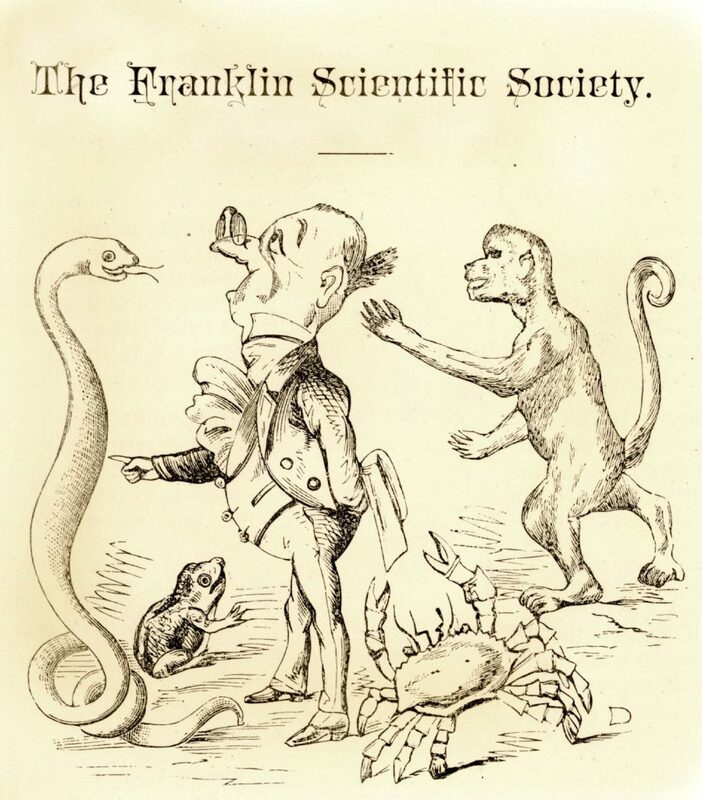 The Franklin Scientific Society was formed in fall of 1874 to promote discussions and lectures on scientific topics and to collect literature and specimens to advance the knowledge of science for the University of Pennsylvania student body. The Society came into existence just as two other related student organizations, the Zelosophic Society of the University of Pennsylvania (founded in 1829) and the Mineralogical Society (founded in 1872) were fading from the student scene. It was the eventual closing of the Zelosophic Society in 1875 that gave the Franklin Scientific Society a boost in its membership and a regular meeting place. The Society supported a popular lecture series each academic year which brought in speakers from the Philadelphia area and other universities to present lectures on a variety of scientific topics. The lectures were open to the public and well attended. There were reports of some of the women’s boarding schools sending students to the lectures. Like all student organizations that are dependant upon training a fresh group of students to continue its existence, the Franklin Scientific Society eventually succumbed to a lack of interest to keep the organization going. This occurred in the fall of 1882 where there were no students willing to begin another season of meetings, debates and public lectures. In October 1882, the dean of the college posted a notice on the Society’s rooms in College Hall that the “rooms are closed by order of the Dean.” This action, however, did not kill the student interests in scientific clubs but led to the formation of a new club called the Scientific Society of the University of Pennsylvania in December of 1882. 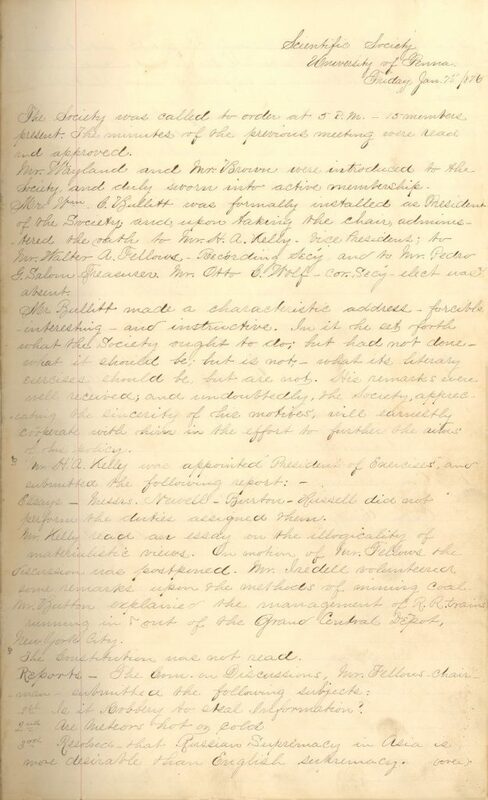 The records of the Franklin Scientific Society consist of a minute book which details the election of officers, the topics of student discussions and debates, and the arrangements made for public meetings as well as additions to its collections of books and specimens.